Square pale through-rail fencing. All materials are manufactured in accordance with the Jacksons ISO standards. • Seamless, concealed rail to post fixing. • Strong, rigid structure, 100mm pale spacing conforms to Building Regulations for anti-trap. • Pales can be extended and set into concrete to protect against burrowing. • Various mounting options including on wall, inset and free standing. • Can be stepped or raked to accommodate sloping ground. • Hop Dip Galvanized finish as standard to BS EN 1461 and can also be powder coated to BS EN 13438 in nine standard colours at extra cost and any other RAL colour. • Additional Rota Spike topping. • Vandal proof and low maintenance. • High security without compromising aesthetics. • Inherently strong and safe designs. • High resistance to cutting. 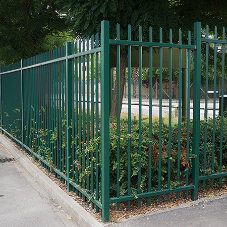 • Suitable for almost any application from decorative and secure to intimidating and highly secure. • Can accommodate Alarm-aFence® or other high security extras. • Post can be adapted to mount CCTV cameras or lighting. • Suitable for incorporation of Jaktronic Perimeter Intruder Detection System (PIDS). Other guarantees The exclusive Jacksons 25-year Service Life guarantee.